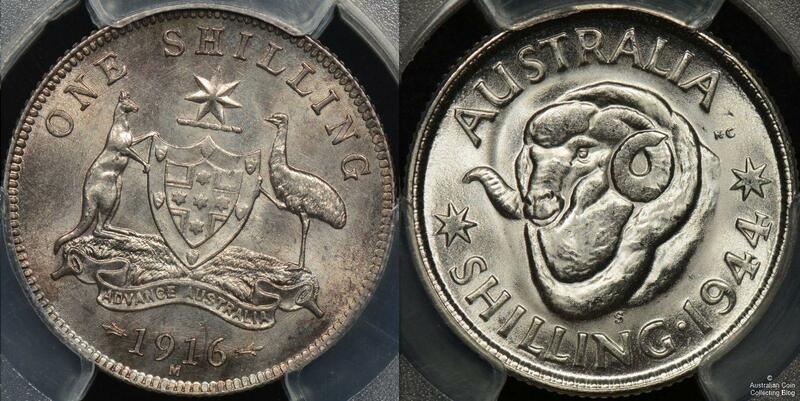 The Australian shilling was one of 7 denominations of pre-decimal coinage in Australia issued from 1910 to 1964. The Australian 1s was issued with 2 reverse designs. Originally with the Australian coat of arms 1910-1936 then with a ramshead design from 1938-1964. There were 4 monarchs during the times of these issues, Edward VII, George V, George VI and Elizabeth II. Like all other pre-decimal Australian coinage the shilling was based on the silver standard. The 23.5mm, 5.65g coins were minted in sterling silver (92.5% silver, 7.5% copper) from 1910 till 1944. In 1946 the coins were debased to 50% silver, 40% copper, 5% nickel, and 5% zinc. The debasement resulted from Australia needing to pay off the huge debts incurred during World War 2. The shillings were minted in Melbourne, Perth, Sydney, San Francisco and Heaton, Birmingham. There were no commemorative issues of the shilling. Keydate coins to look out for are the 1915, 1915H, the 1921* and the 1933. The shilling was not minted in 1919, 1923, 1929, 1930, 1932, 1937, 1945, 1947, 1949 or 1951. The shilling is highly recognised by the ramshead depicted on the reverse from 1938-1964. This was designed by George Kruger Gray based on a prize merino ram at the Sydney agricultural show. The coat of arms depicted on older shillings was designed by W H J Blakemore. The slang term for a shilling coin in Australia was “deener” or more commonly a “bob”.